Welcome to Unpublished Houdini. In this series I'll share a new never-before-published photo of Houdini every Monday for the rest of 2013 from our generous Hinson Endowment. You may think you've seen this photo -- maybe even in Christopher's Houdini The Untold Story -- but look again closely. 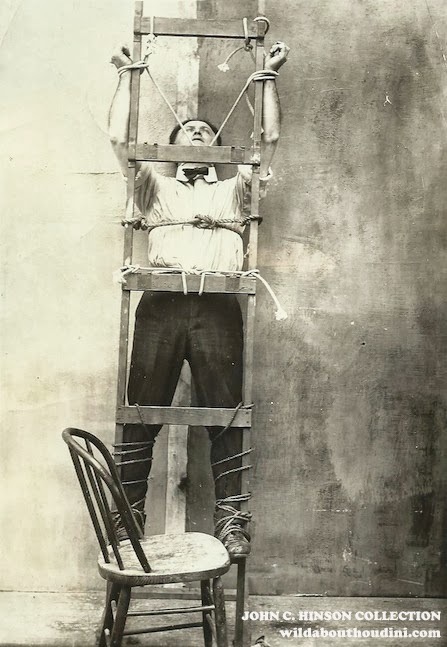 Notice the additional ropes from Houdini's wrists to his neck and the chair sitting in front of the ladder. This is actually an unpublished and uncropped shot taken during the same session as the more well-known photo. But this shot gives us a much better look at the studio setting for this "spectacular fastening." It's an alternate take on a classic image. I'm a sucker for this kind of thing. "Strange as it may appear, I have found that the more spectacular the fastening to the eyes of the audience, the less difficult the escape really proves to be. 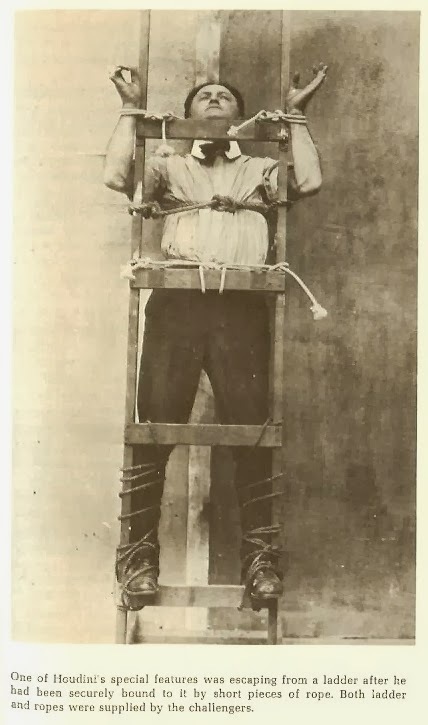 For example, the ladder tie here shown gives the impression of an almost unescapable restraint, while in reality it is simply a slow but sure proposition." Great to see the full photo. So much information. Excellent. Thanks. Wow! Who would of thought there was a 5th rung on the ladder. It is so cool to compare photos. Thanks! You know, I'm ashamed to say that I didn't directly compare the two photos before I posted this. I just thought I knew the other one well enough to know all the differences. But the big difference I missed is the fact that HH's wrists are tied to the 5th rung! In the normal photo they are tied to the fourth. Going to scan the original and link it in the story. Thanks Joe. You never know what you learn from a picture, that you thinks you have seen before.